IISG is issuing two calls for research pre-proposals to address critical concerns facing Lake Michigan, and is hosting an informational webinar on December 9. Anyone who is considering submitting a pre-proposal in response to either RFP is invited to attend. Research is to be conducted in the 2018–2019 biennium. Up to $100,000 per year for two years will be available for funding the Illinois and Indiana portion of projects. Illinois and Indiana primary investigators (PIs) must demonstrate a match of at least 50 percent (one non-federal dollar for every two federal dollars requested). PIs may submit to either the IISG-only request for pre-proposals, or to a special joint RFP between IISG and Wisconsin Sea Grant. Pre-proposals must be received by 6 p.m. EST (5 p.m. CST) on January 23, 2017. 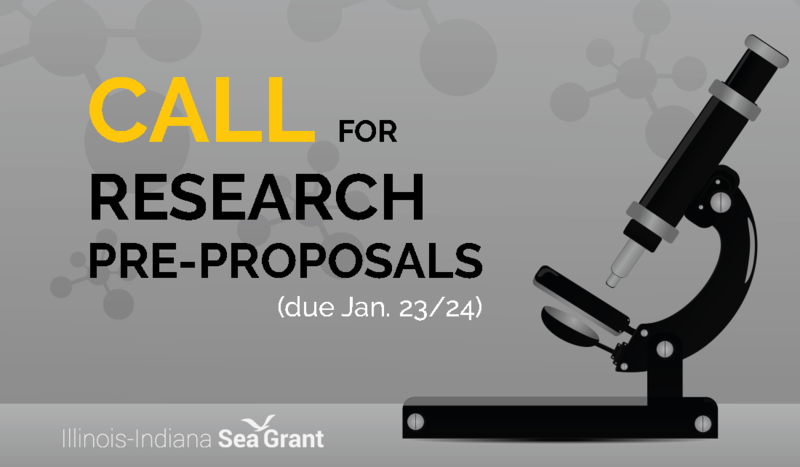 The full request for pre-proposals can be found at http://www.iiseagrant.org/research/IISG_2016RFP.pdf. Pre-proposals submitted to this joint RFP must demonstrate plans for collaboration between at least one Illinois- or Indiana-based researcher and at least one Wisconsin-based researcher. The deadline for submission to both programs is 4 p.m. EST (3 p.m. CST) on January 24, 2017. The full RFP can be found at: http://www.iiseagrant.org/research/IISGWISG_2016RFP.pdf. For more information, contact Assistant Research Coordinator Carolyn Foley (cfoley@purdue.edu, 765-494-3601.